This week is going to be a different kind of study from the usual commentary on biblical texts. Right from the beginning, Jon Paulien informs us that the focus will be on the historical and cultural context of ancient Thessalonica in order to understand better Paul's letter to the church from that city. While the context has the potential to illuminate the message of Paul, it can also mislead the reader if the historical context is given prominence over the content of the biblical text. It is true that God used the language and other cultural elements pertaining to the ancient cultures of the biblical writers to carry His message across, condescending at the human level, but it is equally true that the content delivered through these human means was divine, God's thoughts being far above human thoughts. While the medium of transmission is human, what is transmitted is divine. Apostle Paul went as far as affirming that a natural person could not even understand the divine message apart from the special intervention of the Holy Spirit. Spiritual things are spiritually discerned. It is strange to read Jon Paulien comments that historical and cultural context is something that "helps us to understand how Paul’s original hearers and readers would have understood him. In so doing, it clarifies the meaning of what he wrote and the impact it had back then on both church and society." If he said merely that the form of the message, or the outward aspect of the message impacted the way the original hearers would have understood Paul, this would put things in the right perspective. But the historical and cultural context is not helpful in explaining the way in which the original hearers and readers would have understood Paul’s internal meaning. The historical and cultural context reflects human natural wisdom which does not understand God's message; In fact, it rejects God’s wisdom as folly, because historical and cultural context is simply natural, fallen human wisdom. Consequently it is erroneous to let the cultural and historical context define or exercise control over the interpretation of the text. Ultimately the Holy Spirit who is the Author of the Bible has to have the final word in interpreting what he inspired the biblical authors to write. Paulien rightly affirms that "the more we know about the ideas and beliefs of the Thessalonians, the better we can understand that against which Paul was reacting." However, even this viewpoint can be troubling if it receives an importance that it should not have. First and foremost the gospel and God's message is the way to fight spiritual battles that are universal in nature. This fact makes the epistles of the New Testament, written for a Greek world 2000 years ago, still relevant. While the cultural ideas and beliefs of the Thessalonians may have been unique, Paul was reacting against spiritual ideas and beliefs that are still alive today because flesh, the world, and Satan are still part of human experience. It should be clear that despite different contexts, the message of Paul to the Thessalonians was not "unique", because there is only one gospel, only one Savior, and only one sacrifice for sin that made only one finished, complete atonement that "has perfected for all time those who are being sanctified." (Hebrews 10:14 ESV). In this light we should look at the unique historical context and setting of Thessalonica in order not to be carried astray and derailed by human wisdom opposed to God's spiritual message which can be only spiritually understood, discerned and accepted. 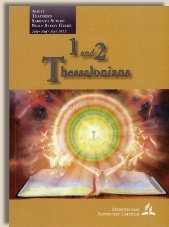 Copyright 2012 BibleStudiesForAdventists.com. All rights reserved. Revised July 12, 2012. This website is published by Life Assurance Ministries, Camp Verde, Arizona, USA, the publisher of Proclamation! Magazine. Contact email: BibleStudiesForAdventists@gmail.com.